This is our fifth event and it’s solely about playing. If you fancy spinning through Sonic, bouncing and bashing your way through Mario or just saving the world from the Mad Bomber please come and take part in this retro event. This is held in collaboration with Creatabot , Retro’Spect Kent and the coFWD community. 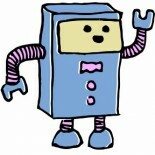 This entry was posted on 27/06/2013 by Creatabot in Creative and Art Events.